Escape Room Research – What Exists Out There? Click the image or this link to find the full summary of data collected. Errol has kindly also provided access to the raw results via Google Sheets. That caveat aside, there is some great information in this document that is great for any escape room owner or game designer. This section in particular I loved, because it lays out a lot to consider when creating a game and wanting to guarantee success. No matter the market, no matter the experience of your average player expected, there are some key points to pull out of this portion of the survey. Outside knowledge and red herrings, don’t do them! Escape room players don’t like them – so don’t bother putting them in there! Cliched game themes are preferred – so don’t shy away from them! I’ve talked about this before with this blog post. 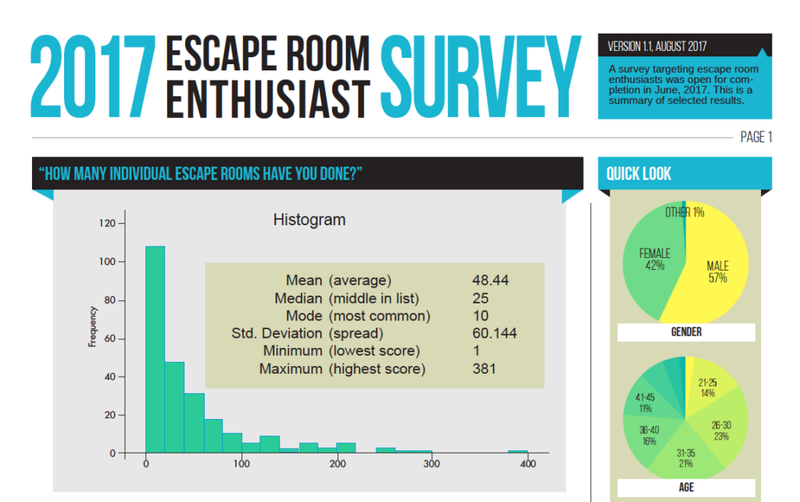 You can really dig into this survey as if you are a member of some of the popular Facebook escape room enthusiasts, escape room owner, or escape room startups, groups/pages, then this information negates the advice there! Players don’t like taste or smell being involved in the game, and scoring systems instead of win/loss states are equally not enjoyed! If you are considering expanding your “immersion” level for the game, perhaps second-guess that decision to create ambient smells in the space. Other sources of escape room research or study are fairly limited at this time. 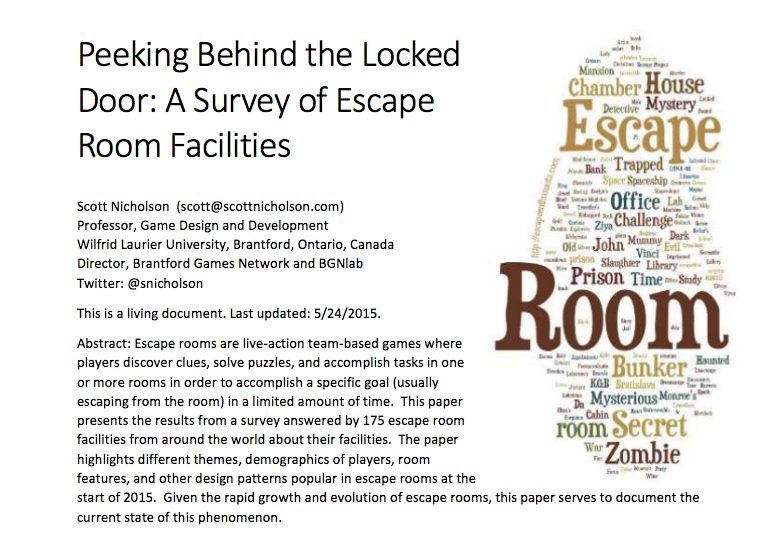 The most commonly referenced document is Professor Scott Nicholson’s Peeking Behind the Locked Door: A Survey of Escape Room Facilities. This document is quite thorough and extremely valuable to new escape room owners or those looking to break into the industry. However, it must be stated that is is now outdated and the industry has evolved significantly since this data was collected. The document does serve as a great glimpse into the industry, and provides excellent academic! 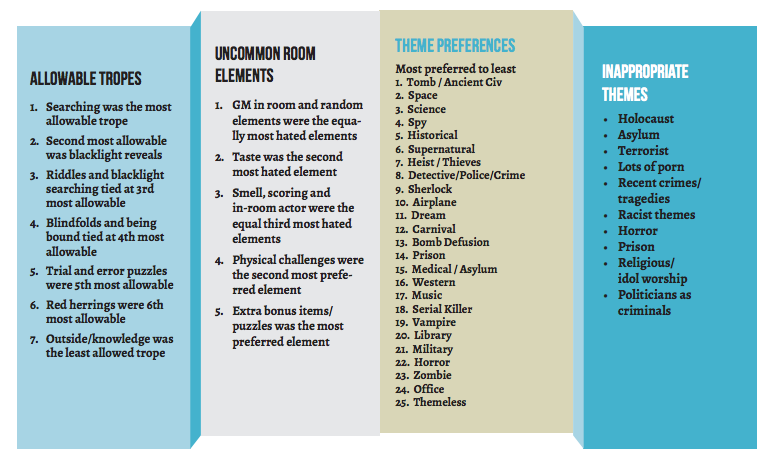 descriptions of the components involved in an escape room and quite simply what an escape room game truly is. What’s key about the thesis and discussion in Nicholson’s article is that a game must have a purpose, and everything in the game must match that purpose. The story must be compelled by the components of the game design and it must contain logical steps. Do players have to stand in specific parts of the room to trigger the box to open? Ask why to make sure this makes sense. A combination lock is attached to an Ancient Egyptian pharaoh’s sarcophagus. If you simply ask why, you’ll know it doesn’t belong. Consider narrative and immersion (yes the elusive immersion) when you’re putting a game together. The locks should make sense inside the game, and players should be able to connect the dots between pieces. You want a “Ah Hah!” reaction, not a “Hunh?” reaction from players when they complete a sequence. All 3 research documents listed here are linked and are all the property of their respective owners. I bow down before them and their abilities to gather and conclusively analyze this data.